This is a simple recipe, pretty to look at and full of bright flavours from Hugh Fearnley-Whittingstall. I used a pink grapefruit, but an ordinary one would be fine. I also used a birdseye chilli, if you don’t have one I’d recommend a sprinkling of chilli flakes instead. 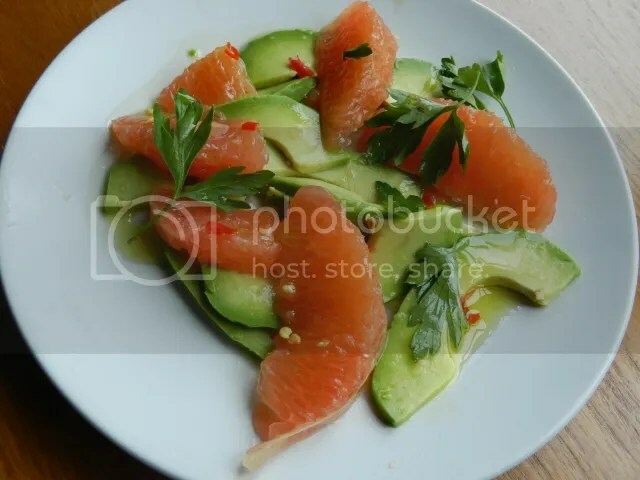 Arrange the avocado and grapefruit slices on a plate. Sprinkle over the chilli, the olive oil and any juice from the grapefruit. Season with salt and pepper and scatter over the parsley. 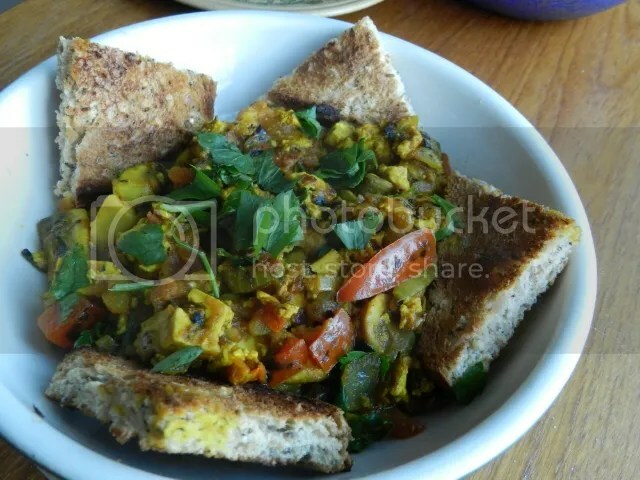 When I first went vegetarian and had a look on the web for things to cook, I came across the concept of ‘tofu scramble’ as a substitute for scrambled eggs. I have to say the idea filled me with horror. Tofu is not egg and I thought it would be the worst kind of fakery and substandard substitution that would fool nobody. But it’s one of those things that I kept on seeing online and some people seemed to like it. Then I found this recipe which frames the concept of tofu scramble not as a scrambled egg substitute, but as an addition to a breakfast menu. The only concession to fakery is leaving in the turmeric – it really does help with the appearance of the dish, it does look a bit grey and grim without it. So here is my version. Not something trying to be scrambled eggs, but a tasty start to the day that stands on its own feet. Heat some oil in a frying pan and fry the onion, red pepper and chilli flakes until the onion is going translucent. Add in the tofu, mushrooms, tomatoes, turmeric and mushroom ketchup. Stir vigorously – the idea is to break up the tofu into crumbly pieces. 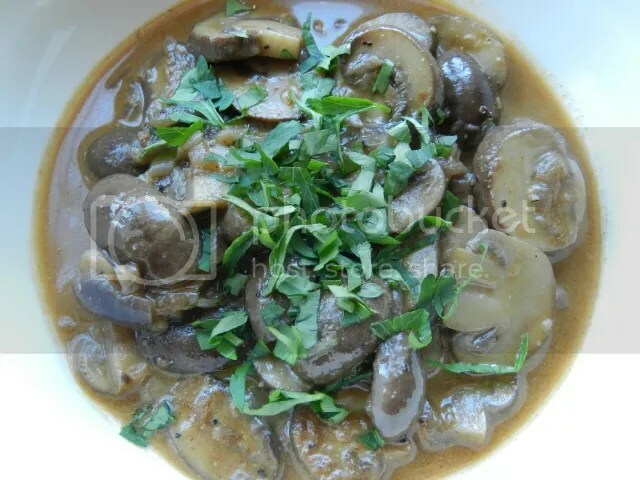 When the mushrooms are cooked and the mixture has lost a lot of its liquid, season with salt and pepper and stir in the chopped parsley. This classic soup should be in everyone’s repertoire, I think. 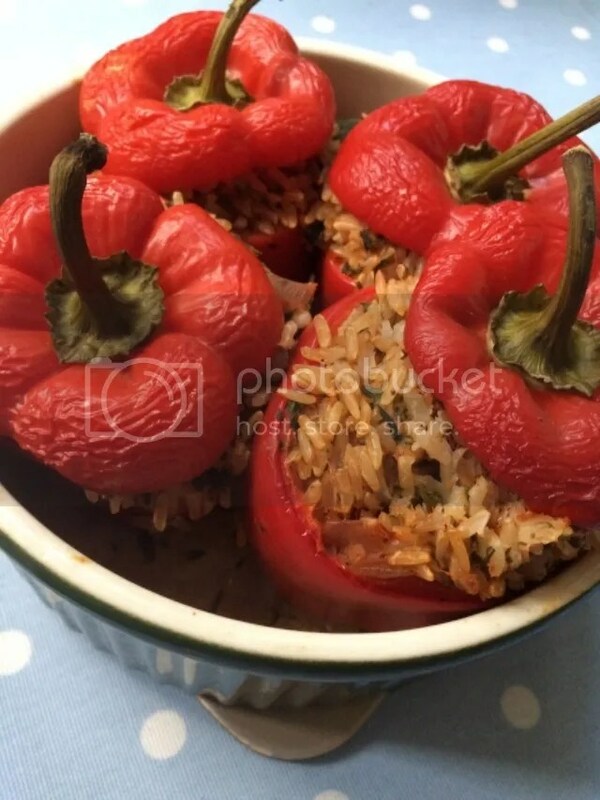 Easy to make, and tastes great from very simple ingredients. The milk or cream really makes a difference to the end product. Blended potato tends to go a bit gluey in texture and the milk stops that from happening. Soy milk or other non-dairy milks will work just as well. You need to be fairly generous with the salt in this soup – potato soaks up salt, so don’t be surprised if you have to add quite a bit more than normal to get the right taste. Add the potatoes and leek to a pan, cover with the vegetable stock and bring to a simmer. Cover the pan and simmer for 20 minutes. 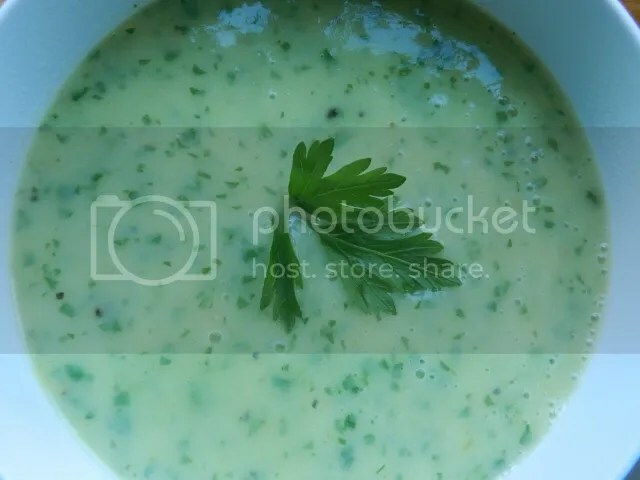 Take off the heat, add the cream or milk and parsley. This is a great way of using one fresh ingredient with some from the store cupboard to create something fresh and delicious. I’ve used parsley here, but a mixture of herbs would do, or some green salad vegetable like spinach or watercress. 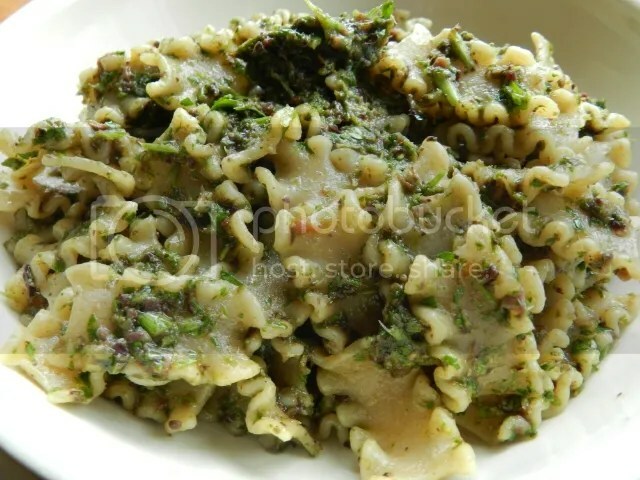 If I can’t be bothered getting the little food processor out, I do a deconstructed version of this by just roughly chopping everything and tossing it into the pasta. 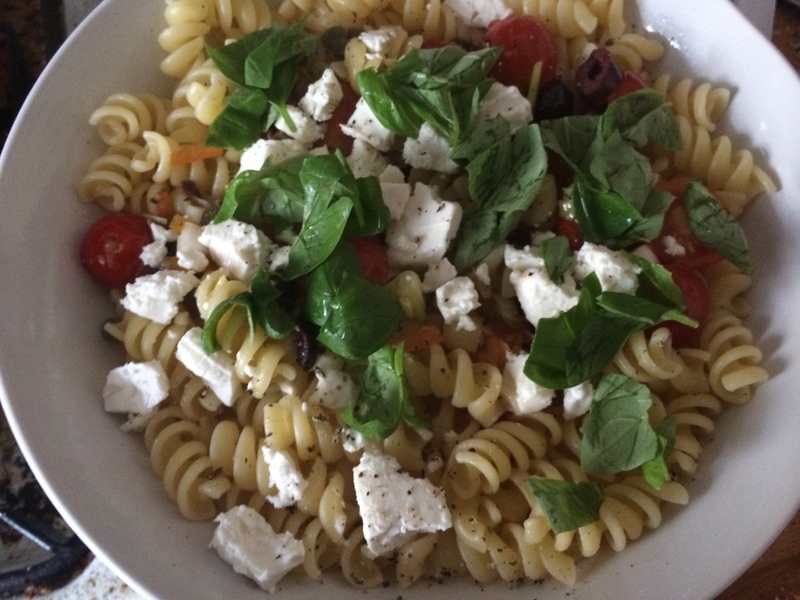 While the pasta of your choice is cooking, put the ingredients in a food processor and whizz until smooth. When the pasta is cooked, drain and then put back in the pan. Stir in the sauce until the pasta is properly coated.